Yet Another Day Done [5_030156] a photo by Steven Christenson on Flickr. It’s all about the altitude. Nothing improves my attitude like a little good old fashioned altitude. Air under me, a vista, and a bit of solitude. My only regret on my most recent trip up this mountain is I didn’t take advantage of the very clear skies to attempt star trails. On the other hand, the wind was whipping the straps on my pack into my face and other body parts so camera stability was going to be suspect. I have a huge backlog of creative ideas from this pinnacle at the South Eastern Edge of the San Francisco Bay. 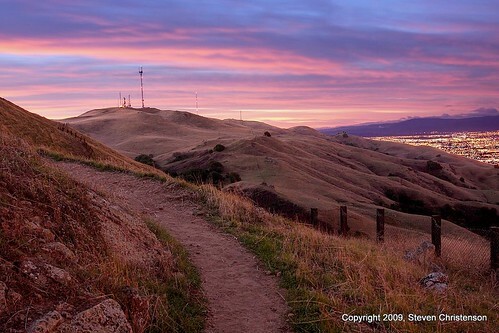 The place is called Mission Peak Preserve and it is for me an absolute jewel. It’s existence is a testament to the vision that some have pursued in keeping parts of this very urban area natural and rugged, and the generosity of many landowners to contribute large expanses of hilly and mountainous terrain into eternal naturalness. This also happens to be one of the few wilderness areas that is open after sunset – until 10 pm in fact. Nothing quite prepares you to watch the fading glow of a fiery sunset be slowly replaced by hundreds of thousands of shimmering man made lights. It helps that it takes some serious, well intentioned effort to gain the altitude. A steep trail awaits you no matter which direction you approach from. And the reward for your sweat is a view with solitude since many hikers scurry down the mountain as soon as the sun dips below the horizon… long before the best color and the spreading man made light improves the view. 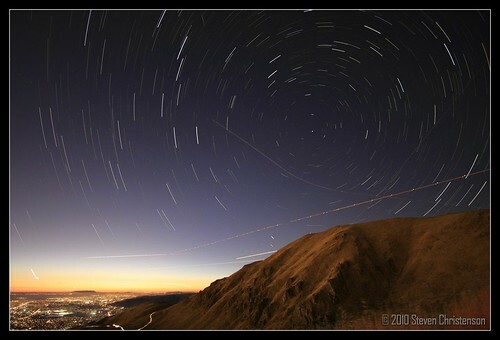 Some co-workers and Night Photographers set out with me for the Hang Glider Launch Area on Mission Peak. Why this area? Why not? 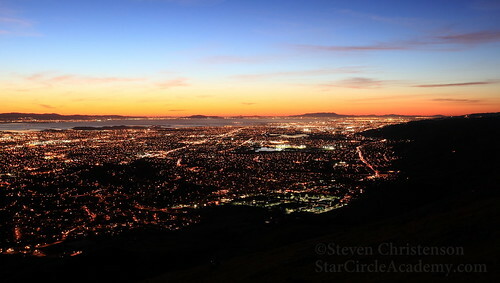 I’ve been all over Mission Peak, but never at this area for sunset. It’s about 700 feet lower in elevation than the summit, but it allows a 180 degree view of the San Francisco Bay, including downtown San Jose (not this direction, of course). However there is not a lot of interesting foreground here as it is gently sloping. The road along the foothill at the right is Mission Boulevard. On the distant horizon is Mt. 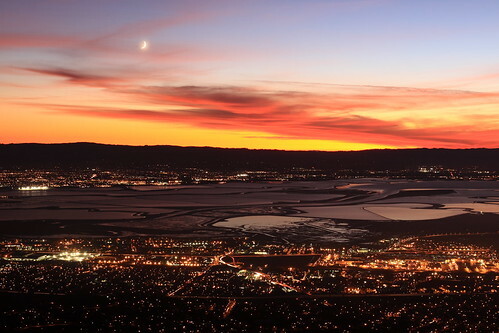 Tamalpais which is in Marin County across the Golden Gate Bridge – 47.5 miles from this location. In the foreground with noticeably different colored lights is Ohlone College. This entry was posted in Image, Photo Tip, Travel and tagged California, event, Fremont, hiking, Mission Peak, mountain, Night Photography Meetup, San Francisco Bay Area on April 1, 2011 by Steven Christenson.